Today I have a yummy Crock Pot recipe for you that is certain to clear your sinuses. Better still, it's super easy to make. You just dump everything into the Crock Pot, put the lid on, turn it on, and walk away. It doesn't get any better than that. Enjoy! yum! i love crockpot recipes. This is right up my ally! I will surely be making this for dinner sometime this week! Love that you can just dump it in the crockpot. so much for my diet- i might eat the whole pot! Your chocolate mint truffles were a hit on new years! My family loved them. I can't get over how easy they were.....I'll definitely use that recipe next year! This sounds wonderful! How did you post the receipe so pretty? 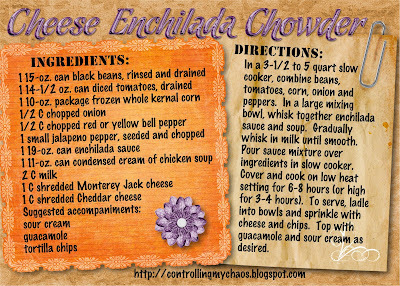 Sounds so much easier than the ordeal I go through making traditional chicken enchiladas. Maybe it's time to dust off the old crock pot.